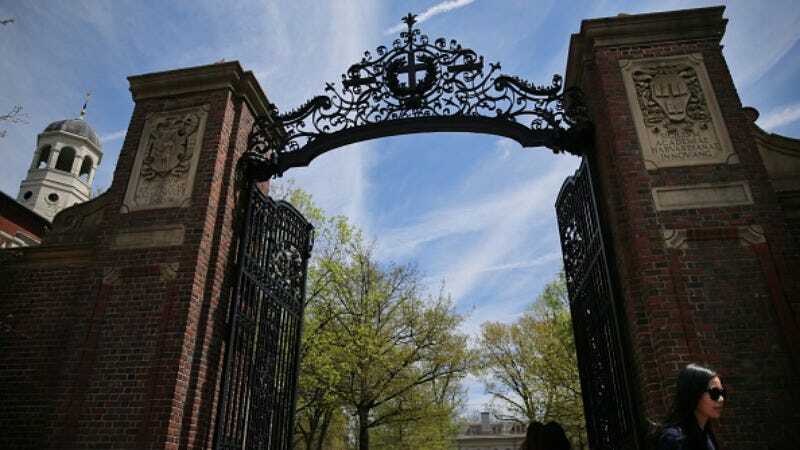 Trying to one-up each other with memes has turned out poorly for a group of recently admitted Harvard students, who had their acceptance offers withdrawn by the Ivy League school. According to The Crimson, this all began in a general Facebook group for Harvard students, where a bunch of meme-loving students joined together to create an offshoot dedicated to posting photos with captions in place of, you know, communicating. When that group’s memes proved to be not quite dank enough, a bunch of students splintered off into a private Facebook group chat, where they reportedly posted more obscene memes. Thus, the “Harvard memes for horny bourgeois teens” group was born, with acceptance into its hallowed, digital halls requiring that prospective members post something “borderline offensive” in the original meme group so that these wannabe provocateurs would know that you were down, we guess. School officials reached out to the students for an explanation of their memes, which must not have gone over that well, because Harvard ended up rescinding acceptance offers to 10 students (so far). Opinions on the decision vary, with some students telling The Crimson they don’t believe any internet activity that’s unaffiliated with the university should be monitored, let alone result in a rejection from the school, while others think Harvard acted accordingly. But they’ll all probably be a bit wary of group chat invitations going forward.